Love your honesty and sensible ideas Matt Hanes. AND the way you respected what the team have already done. We are still in the process of beginning a trial of parents as observers here. I will keep your points in mind for this. I imagine that if your ideas could be worked on then the uptake of Canvas in elementary could take off. Honestly, we have given up on parents as observers. We didn't like the log-in process, mostly, and the app didn't help. For the teachers who really want the parental involvement, we have switched to making the course public and sharing the link with them instead. Our grades are in our SIS and parents have full access to that. We like it. What do you think about that? Hey Lisa Risch - nifty idea. Your reasons are valid too! Do parents have access to their children's work? We tried the public course thing for a while, but teachers kept posting copyrighted material and it got to be a real hassle for me to keep up with all the take-down requests. Our school district did this really strange Canvas roll out where we bought it and then didn't have any formal training process for the schools. So the only schools that have been trained on things like "you can't post copyrighted material on a public site" and "you can't post videos of students without parental consent" are the ones that specifically asked for me to come out and train them. I had a "Getting Started In Canvas" training course available, but that didn't get a lot of traction. The Canvas parent account creation is actually a significant step up from our SIS grade book app process which requires the parent to go to the school, show ID, and get a password to sign up for an account. The pairing code is way easier for us because they can just generate a new one if the parent forgets which email and password they used to sign up. Our SIS process is a total pain if the parent forgets their account information and requires someone from our support team to intervene. To be honest, my ideal scenario would be for the Parent App to have the functionality listed above to move teachers towards posting everything in Canvas. That way parents would have a little uniformity in the methods of communication used by teachers at various schools. We also make school-wide courses that administrators can use for communications as well. Once we had all that going, it would be so much easier to convince our administrators to use the the Canvas Gradebook as the real grade book and then we would have everything a parent needs in one app. That's the dream! What other LMS could compete with that? Thanks for the heads-up about copyright and parental consent for photos and videos, Matt. I also completely know what you mean about having your training course not get a lot of action. One app for parents? One platform for teachers and students? You're right - that should be the ultimate goal for all of us! Thanks for posting this, Matt Hanes! I've shared it with the team and we love the ideas. Thanks for sharing these ideas! Some of those updates would definitely help families. I think some of the limitations of Canvas Parent are connected with the complexity of the Observer role in general. Definitely kudos to Peyton and the Mobile Team for doing what they have with the information and resources available from a role which is implemented differently within institutions. (1) Push notifications on for Announcements by default ...although I'd add Conversation Inbox message as well. 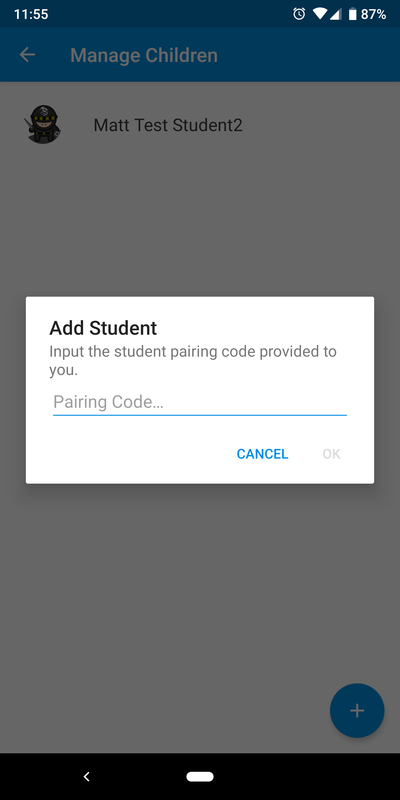 (2) Pairing code in the app. ...it would make life so much easier! (5) Excluding Observers from announcements. ...do you want to create an official Feature Idea for Ideas? I'd co-author it with you if you'd like. It's a brilliant request, and I think it would make a significant improvement to the feature for K-12s. I will definitely create that idea and tag you in it. That would probably make that more likely to happen since that is probably out of the scope of the Mobile team. I'll update this post with the new idea when I get a chance. Thanks for the suggestion! So you can do that on the Android app, I didn't realize that the iPhone app didn't have that feature yet. Probably means we'll have that one very soon! Re: Parent App: How to Add More Than One Student?